If you didn’t know, we are huge Supernatural fans. Our love of the show is even connected to food! Supernatural is our Taco Tuesday show. We haven’t missed a Taco Tuesday in over 3 years. When we are at home, tacos get enjoyed while watching Supernatural. The show is so important to us that it even was a part of our wedding. So when we were looking for inspiration for our latest recipe for Comic-Con HQ. We knew just what we wanted to do, Pig ‘N a Poke Tacos. When deciding what programming from Comic-Con HQ to base our recipe off of we came across their original content show Kings of Con. Kings of Con is a single-camera comedy created by Rob Benedict and Richard Speight Jr. (both who’ve starred in Supernatural and are fan favorites). It premiered on Comic-Con HQ on November 15, 2016. It follows the behind the scenes antics of the two actors on the Fan Convention Circuit. It also just so happens that Richard Speight Jr. portrayed Loki in the episode of Supernatural (S3E11- Mystery Spot) that inspired this recipe. 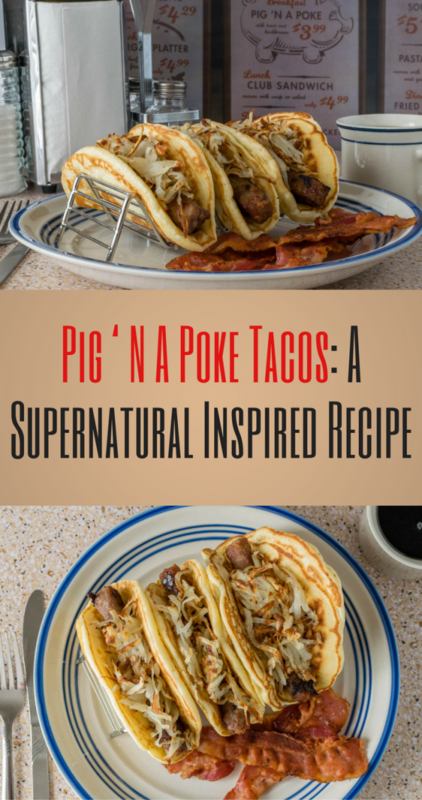 For our Pig ‘N a Poke Tacos, we were inspired by the dish that Dean orders in Mystery Spot. Instead of just rehashing the same recipe, we combined it with our Supernatural Taco Tuesday tradition. We tried a few different brands of pancake mix and found that for creating a foldable pancake, Bisquick worked the best. Also, to add a bit more flavor to the tacos, we used maple sausage (Farmer John’s packed a super maple punch). We love hosting giveaways! Comic-Con HQ has offered to give one of our lucky readers a free month of Comic-Con HQ! Enter below and the winner will be chosen on June 7th (Kim Rhodes’, Sheriff Jody Mills and Sue on Kings of Con, birthday). Good luck! Comic-Con HQ is an ad-free streaming video-on-demand channel that features an evolving slate of programming including original scripted and unscripted series, recurring daily and weekly entertainment news, commentary shows, a highly-curated selection of film and TV genre titles, sneak previews and special features, as well as unlimited access to live and archival programming from their world-class events, including WonderCon and San Diego Comic-Con. Prepare all of the separate ingredients. 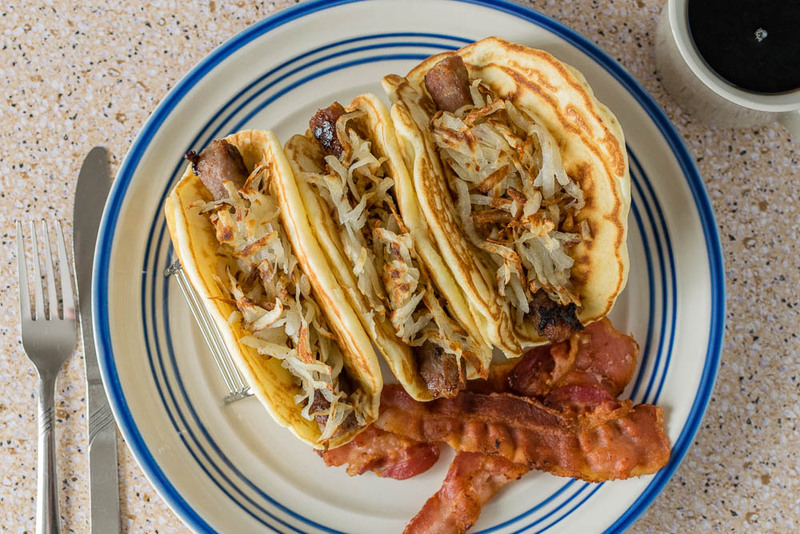 If using taco racks, put pancakes in them while they are still warm. Load taco with 2 sausages. Serve with a side of bacon (That's how Dean would have ordered it). *The Geeks created this content in partnership with Comic-Con HQ. Giveaway items provided by Comic-Con HQ. All opinions are wholly our own. View our Disclosure Policy for more info. HAHAH…love the title. Any kind of taco is a winner with us. These sound and look delicious. Fun to make, and more fun to eat. Perfect for entertaining too. Now this is my kind of breakfast taco! 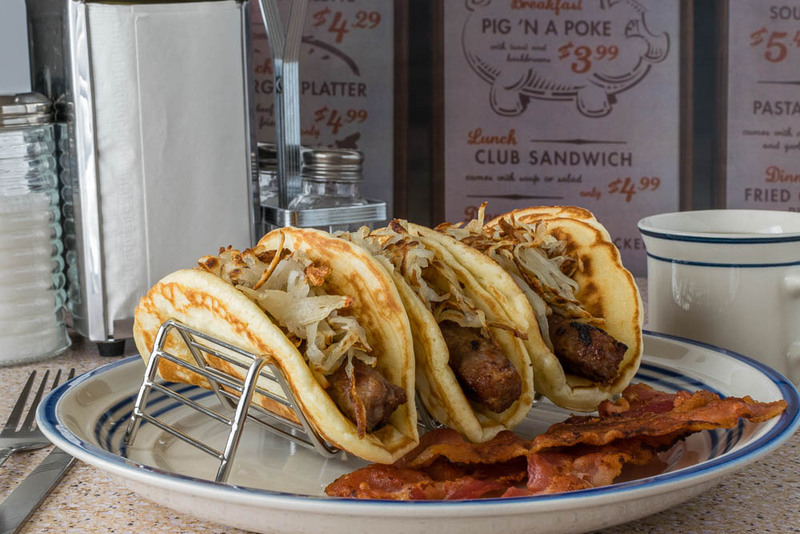 I love pancakes with sausage, my mom used to make rolls with them when I was a kid. I see these in my brunch future. Only thing these are missing is a nice fried egg on top! Definitely going to try my hand at these bad boys! This is so awesome! Breakfast, Tacos and Supernatural are my favorite things! I love this idea of a complete breakfast in a taco. Yes, putting a fried egg on top would take it over the top (in the best way possible). I entered your giveaway 🙂 I love how easy this recipe looks. I’m gonna try it with veggie sausage. Ah, the Tuesday special! What a great idea – this looks yummy, and a bit of hot sauce perhaps?